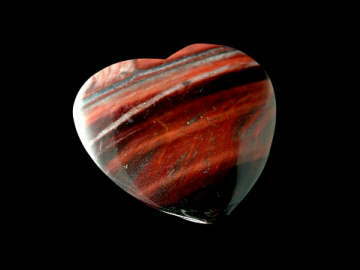 Beautifully coloured, vibrant Tiger Iron Heart (this is a flat heart, not puffed). Tiger Iron is a combination of Tiger Eye with Red Jasper and Hematite. It aligns/vibrates with both the Sacral and Root Chakras. It possesses the properties of all three of the above stones but is primarily used for grounding, is a protective stone and working with or wearing a piece promotes courage and physical and mental strength. Excellent to have around when recuperating.